The iPhone to-do app HoneyDo takes its name from a familiar phrase most of us hear on Saturday afternoons while working around the house: “Honey, can you do…” Offered by High Five Labs, HoneyDo stands out from an already crowded field of to-do apps because of its sharing capabilities. The $5 app lets couples, families, and groups share to-dos. Share and Share Alike: HoneyDo doesn’t just list your to-dos. It also lets you share tasks, assigning them to other people. Let me give you an example of how HoneyDo works. Let’s say I’m out running errands and my girlfriend wants me to pick up the dry cleaning while I’m out. She can text me, sure, but I might not see it. (And, depending on your service plan with AT&T, those texts can cost you money.) With HoneyDo, she can create a new task, and, after the task syncs to my iPhone, I have a notification a few seconds later. The syncing process works really well, too. To use HoneyDo with others, you must first create and “host” a private group on your iPhone. HoneyDo assigns a simple passcode to each group, which you then send along with an invite to each person you want to include. Your invitees can begin assigning tasks within seconds of signing up. While this may seem like overkill if you’re only using HoneyDo with your significant other, it does come in handy when you use the app with larger groups. Once in a group, you can create and assign tasks to anyone in the group. While using HoneyDo with just one other person is obvious, doing so in a group can be slightly more complicated due to a curiously omitted feature. 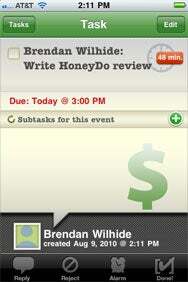 In HoneyDo, you can either assign tasks to one person or to anyone in your group. If you assign a task to a specific person, either you or the assignee can edit that task. If you assign a task to be open ended—one that anyone can complete—only the task giver can edit the task. The omission of the ability for anyone to edit a task is a curious one for an app which touts sharing tasks as its major feature. While you can only add tasks via the HoneyDo app—you can’t e-mail them, for example—you can discuss projects via the “reply” function, which is essentially a private comments thread for each task. You can also add HoneyDo tasks to your iPhone’s calendar via an options screen. HoneyDo provides a solid, sharable to-do list. In fact, its name is rather misleading given that the app works well for groups of all sizes, not just couples. HoneyDo is a slick, easy-to-use task manager that makes navigating chores a breeze.